Today, Pumpkin & Phantom will join us to demonstrate these deep, complex lessons brought to us by Cosmo. 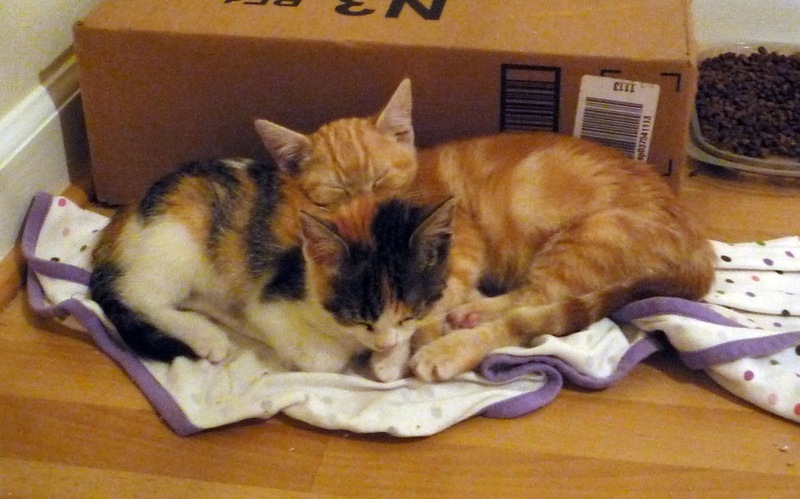 Yes, Pumpkin and Phantom are two adorable kittens, one nestled on top of the other. However, upon a closer analysis, it is obvious that the kitten on top is asserting its dominance, even when sleeping. Relationship forecast: Shaky. Unless they switch sleeping positions. 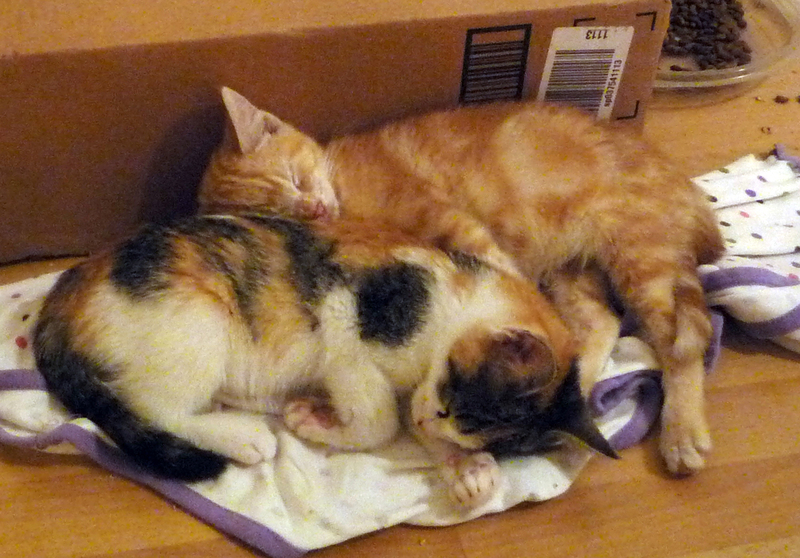 The Kitten Reverse Spoon sleeping pattern indicates a friendship of comfort. The Kitten Reverse Spoon results from an active lifestyle of chasing tails and mysterious red dots of light. This energy can open up a (kitten) relationship with proper direction. Relationship forecast: Good, with guidance. 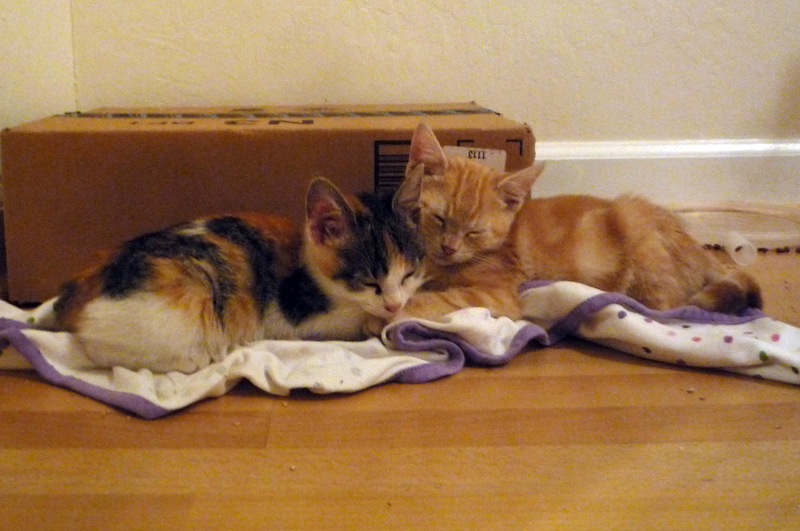 At first glance, the Kitten Side Snuggle might seem cold or formal. It is believed to be reserved for new friendships. Contrary to this belief, the Kitten Side Snuggle serves as a metaphor for love. The kittens later awaken to gaze in the same direction. And what is love? It is not two people kittens gazing into each other’s eyes, but two kittens gazing in the same direction. PS: The kittens have found new homes now! Yay, San Francisco SPCA! If I can’t pull off a blog post, I can at least give you this……. Aww…. hopefully the tolerance switches into a deep appreciation soon! I have two cats who were at war, then they had kittens at the same time, and raised all the kittens together. Now they are friends. Beautiful. OMG! I love these kittens.